Construction workers begin the demolition of an abandon building that was a location of high crime and drug sales. 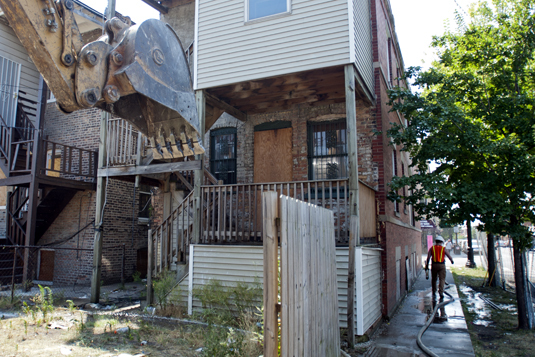 The city began demolishing a number of buildings in neighborhoods on the South and West sides Thursday, as part of a Mayor Rahm Emanuel-backed strategy to cleanse neighborhoods of gang activity. Certain vacant buildings attract gang activity and violence, Emanuel contends, and they need to come down. Some are in such disrepair that they need to be demolished, said Caroline Weisser, spokesperson for the city’s building department. But housing advocates, like the folks at Action Now, want the city to use funds from the infrastructure trust to rebuild neighborhoods. Empty drug wrappers, alcohol bottles and condoms were all over the floor inside the building that was demolished as part of Mayor Rahm Emanuel’s mission to stop gang members from using abandoned buildings as their headquarters. Twelve buildings were demolished today. The vacant buildings were littered with discarded items.